A glance out the window early this morning afforded us an uncommon treat --- the sighting of a yellow-headed blackbird perched in our Hawthorne tree. Crowds of red-winged blackbirds have been bringing their young to the feeders these days, and somehow this yellow-headed fellow found his way in the crowd. He boded his time for a spot at the busy feeders! Which gave me a chance to run for the camera. Had to share my glimpse of heaven today. Thinking of you and wishing you a happy Friday. Your backyard is absolutely breath-taking!! I love that bird too..birds are something that I love to watch and listen to!! 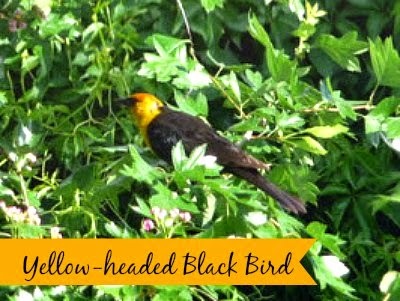 I did not know that there was such a thing as a yellow headed blackbird. I often saw red winged blackbirds, but this was a surprise. Thanks for sharing that beautiful photo. Wishing you a relaxing day today. Your yard and patio are fabulous! I wouldn't want to leave if I were you.I'd plop myself down with a good book and read until dusk. Never seen a Yellow-headed Blackbird. Great shot. I have never seen one of those here in the eastern US. Nice to see it!